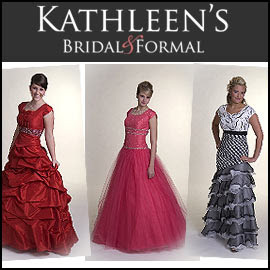 If you're looking for a customized, modest prom dress, Kathleen's offers "endless possibilities." The company has been in business since 1992, creating new dresses each season. The website displays many different types of formal dresses, and customers may contact the company for special order gowns in the color and size specifically desired. Styles include A-line, mermaid (fit or flair), empire, and ball gown. Colors and patterns include plaid, turquoise, bright green, rose, aqua, yellow, black and others. Kathleen's also carries many additional products: wedding gowns, LDS temple dresses, bridesmaid dresses, flower girl dresses, baptism dresses, veils, headpieces and more. It also appears that the company offers prize contests and special offers on a regular basis.